Samsung has kept the swipes in the phonebook, enabling quick dialing (right swipe) or sending a text (left swipe). The Quick contacts feature is there too, displaying, upon a tap of the contact picture, a pop up menu with shortcuts to call, text, email or Google Talk. Tapping on a contact reveals all available details, and now shows two tabs instead of four. The first one is the About tab, with the person's photo on top. If configured, the right tab displays their latest updates from social networks or Google Talk. Information is perfectly organized into different sections for phone, email, etc. If the phonebook finds duplicate contact entries, it'll prompt joining them. Furthermore, there're a plethora of options once you hit the Menu button. You can view the call history, as well as join, unjoin and share contacts. Samsung has even added a built-in reject list. A new feature lets you choose a specific vibration pattern as an incoming call alert, just like you would a ringtone. A set of predefined patterns is offered, but you can make your own too. There's plenty of contact information you can assign to each contact and it still remains neatly organized. You have all the types listed (numbers, email addresses, etc.) and, just like in the previous version of TouchWiz UI 4.0, there's a plus sign on the right - tapping it adds another item of that type. Pressing the minus sign under it deletes any unneeded field. Of course, the real flexibility of the phonebook becomes apparent when you sign into your social networks. After syncing, the phonebook will automatically merge contacts (you can do it manually too), so that the contact details are pulled from those sources as well. The in-call quality of the Samsung Galaxy Express is really good with crisp and loud sound. Reception was also problem-free and we didn't suffer dropped calls though in areas of very poor coverage the sound would occasionally break up. Another cool feature that the Samsung Galaxy Express offers is Direct Call, which lets you dial a number by lifting the phone up to your ear while browsing contacts or reading/composing a message. Smart alert will vibrate the phone when you pick it up, if there are any missed calls or messages. You can, of course, use the old flip to mute gesture too. 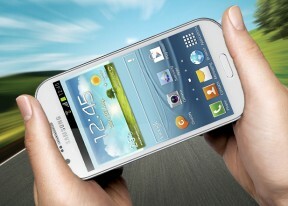 Voice dialing is available too and taken care of by S Voice, which activates on a double tap of the home button. Thanks to the proximity sensor, your screen will automatically turn off during a call. The available options during a call include using the keypad, muting, holding the call or adding another call to this conversation. We also ran our traditional loudspeaker test on the Express. It managed a rating of Good, which means that you should be able to hear it well, even in loud environments. More about our loudspeaker test as well as other results can be found here. One thing we really appreciate is that the tap to compose box grows as much as it needs to - it can fill the entire screen (above the on-screen keyboard that is), growing to 10 lines. Adding multimedia content to the message automatically turns into an MMS. You can either quickly add a photo or an audio file to go with the text or compose an MMS using all the available features (like multiple slides, slide timing, layout, etc.). The multiple slides are all shown inside the compose box. The Galaxy Express also features a combined inbox, which brings together all your mail in a single folder. This can be quite handy if you have lots of accounts and you just want to check if there is a new message needing your attention. For each email account, the app gives you security options (e.g. encrypting outgoing email and signing it with a private key) and a sync schedule, which can be set to check for new mail more often during "peak schedule" (you can pick the days of the week and start and end times when "peak schedule" is active). The Samsung Galaxy Express comes with several text input options. You have the traditional QWERTY keyboard in portrait mode (which is a little cramped) and landscape mode. There are a handful of clever tricks that this keyboard can offer. You can swipe left and right to switch between letters and symbols or you can enable "Continuous input", which lets you input words by swiping over the keyboard (yes, like Swype). If you like swiping your finger around but Continuous input isn't your thing, you can try using the handwriting recognition. It's quite accurate too. The Samsung Galaxy Express has very advanced text prediction features to minimize typos. If you allow it, it will scan through your emails, Facebook posts and Twitter posts and learn how you write (which words you use more often and so on). You can, of course, use voice input and, since the Express is running Android 4.1 Jelly Bean, this will work even if the phone is offline as long as you have downloaded the required language package.